In Japan, cherry blossoms are celebrated for their fleeting beauty. But the flowers are also edible and are sometimes gathered in their barely open state and cured in salt or pickled in umeboshi (salt plum) vinegar to extend the opportunity to enjoy them. As they begin to lose their petals and fall, the fading flowers also make an excellent fresh garnish for desserts. There are many species and cultivars of cherry trees, but the best choices for edible blossoms are those cultivated for ornamental use rather than fruit production. There are more than 200 cultivars of ornamental cherries in Japan, but here in the American Northeast, people are primarily familiar with either the pale, five-petaled Yoshino cherry or the deep pink, double-flowered ‘Kanzan’ cherry, both of which bloom profusely in late April to early May. These cultivars provide the glorious show on Brooklyn Botanic Garden’s Cherry Esplanade and are popular in many home gardens. Their blossoms also make excellent edible decorations. More: Learn how to use edible flowers in a salad or other recipe. Using sakura, or cherry blossoms, in a traditional Italian dessert is an unconventional twist on the Japanese tradition. Creamy panna cotta and delicate cherry blossoms make an exceptional pairing. Panna cotta requires only a few ingredients and is incredibly easy to prepare ahead of time. This recipe is wonderful alone, but you may also serve it with fresh or macerated fruit. Enjoy this panna cotta as the cherry blossoms begin to fall in waves like pink snow, signaling the transition from spring into the next phase of life. 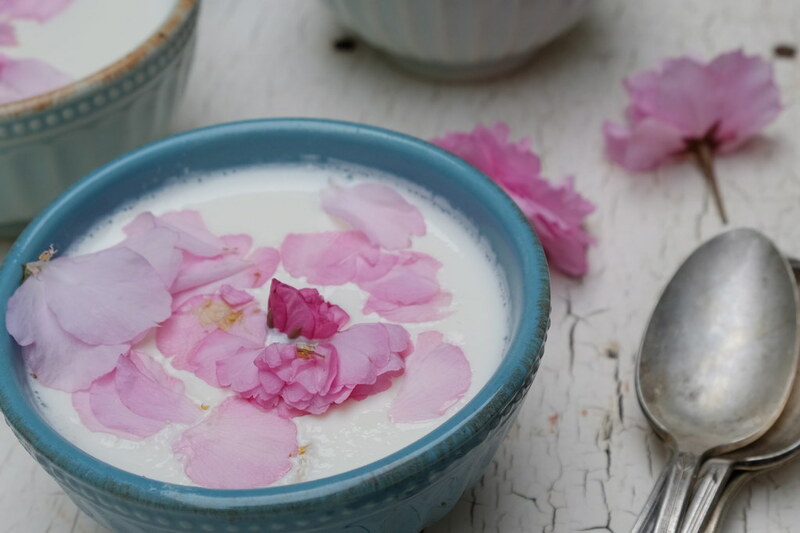 You can also make a summer version of it later in the year, by substituting rosewater for the almond extract and rose petals for the cherry blossoms. Pour the half-and-half into a medium, heavy-bottomed saucepan and sprinkle the gelatin evenly over the surface, allowing it to "bloom" for about 5 minutes. When the surface of the half-and-half looks wrinkly, heat the mixture over low flame, stirring until the gelatin has dissolved, about 2 or 3 minutes. Whisk in the sugar and almond extract. On the lowest setting possible, gently stir until the sugar has dissolved and the mixture is quite hot, but be careful not to let it steam or boil. Remove the mixture from the heat, pour into the ramekins, and place in the refrigerator to cool for about 15 to 20 minutes. When the panna cotta has cooled but not set, sprinkle the cherry petals over the surface, gently pressing them in without submerging. Allow to cool completely in the refrigerator until firm, 3 to 4 hours. Serve chilled.